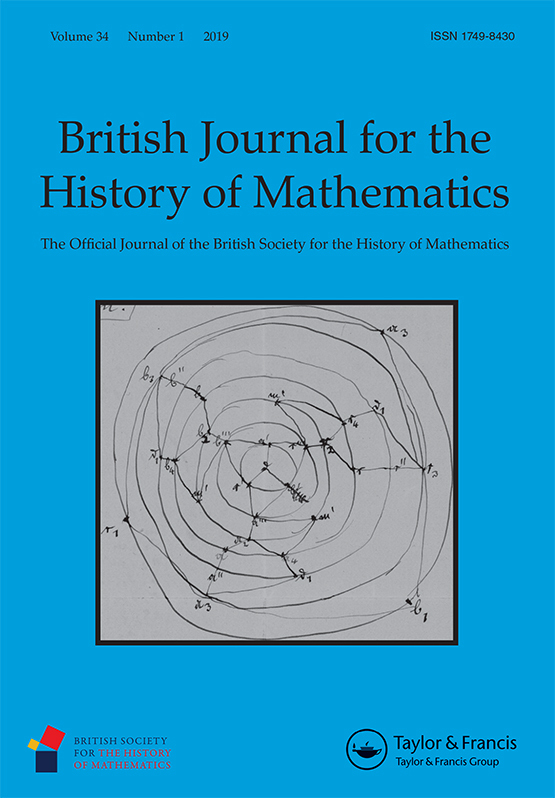 The British Journal for the History of Mathematics is the journal of the British Society for the History of Mathematics: it publishes articles, reports, and book reviews on a range of historical topics. Articles on local mathematical history, the use of history of mathematics in education, and those reflecting individual interests and research are particularly encouraged. The latest copy of the Journal (Volume 34 Issue 1, 2019) is being distributed by our publisher, Taylor and Francis, to BSHM members at the end of January 2019. If you are a member and do not receive this issue, please contact the Membership Secretary, Ken Lord. The Journal is published on behalf of the Society by Taylor and Francis. From 2006 it has been available online to institutional subscribers at the Taylor and Francis website. On that site it is also possible to request a free sample copy of the Journal, sign up for table-of-contents alerting, and view tables of contents of the Journal from 2006. Subscribers may also access past issues of the Journal electronically via Taylor and Francis. BSHM members receive complimentary electronic access to past issues of the Journal; if you are a member and would like to find out more about this, please contact us. If you are interested in submitting an article for inclusion in the Journal, please see the Instructions for Authors page on the Taylor and Francis website, or contact the Editor, Benjamin Wardhaugh.